The month of June is known to be the most favorite month for weddings. So if you have an upcoming wedding marked on your calendar, and are scrambling around for Korovai suggestions, you will have a great head start after this post. If you read my previous Korovai post, or my Paska recipe post, you already have a recipe for a Ukrainian Wedding Bread – Korovai. Today I will share my recipe and technique for making the various symbolic decorations for your Korovai. Korovai bread is basically a paska bread, with additional decorations. Korovai can be a single layer (one round bread), two tier (two round breads in two different sizes, and stacked up), or even three tier. 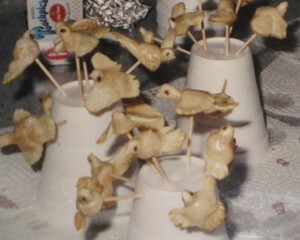 No matter how many tiers is your Korovai, the basic decorations consist of love birds, cones, rosettes, branches, etc. There are two types of birds on a Korovai. Ones with closed wings, which represent the females, and ones with wings spread out (for courting and protection) represent the males. This information was shared with me by a well experienced Ukrainian Korovai baker, so even though I am not sure where it originated from, it makes a lot of sense to me, and I am passing it on to you as well. I have seen many Korovai makers using only one style of birds, and usually they are the ones with closed wings only, which is fine too, as long as there is at least ONE PAIR of both, representing the bride and groom. I prefer to have them in pairs throughout the Korovai, so I will demonstrate how to make both. The dough for Korovai decorations is totally different than the Korovai itself. Korovai decorations are not suitable for consumption, while Korovai can be cut up and shared with quests. 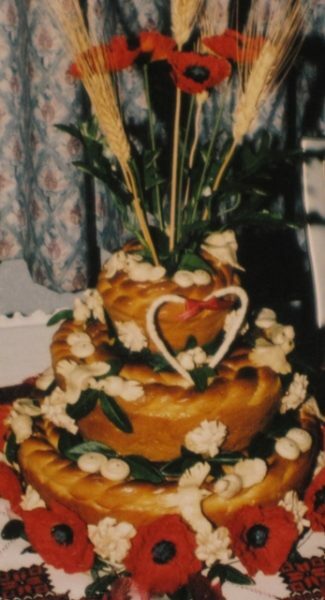 In Ukraine Korovai is consumed at the wedding, shared with the guests, so decorations are made of the same dough as the Korovai. Often times the Bride and Groom have a second one for themselves to take to their new home, or to keep as a memento. In a medium bowl, place half of the flour, corn starch, and shortening. Add 1 drop of yellow food coloring to 2 cups of water, set aside. Use 1/4 cup of the yellow water, and add it to the flour mixture. Knead the dough for about 5 minutes, to make it nice and pliable. 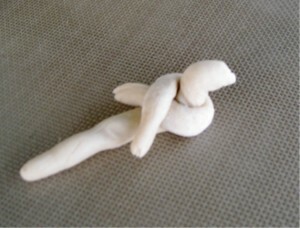 Place the dough in a plastic bag, to keep it from drying out. Line a baking sheet with an aluminum foil, and grease lightly with shortening (I use Crisco). Wipe off excess fat with a paper towel, set aside. 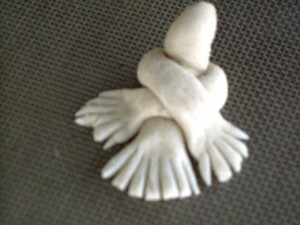 Using small pieces of the dough at a time, to make the birds (the smaller the birds, the less dough. 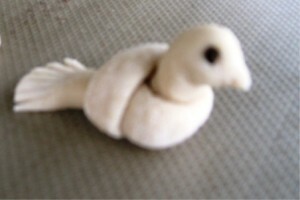 (For medium size birds you will need a ball of dough the size or a grape, or 1 inch in diameter). Make more birds than you really are planning to use, to allow for a better selection, and breakage. 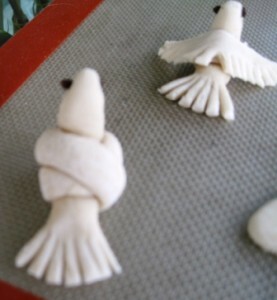 Make sure to secure the bird's eyes into the fresh dough, before baking. 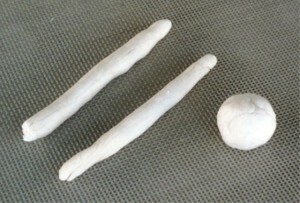 This is the dough ball, which will allow you to form two 4 inch long dough logs to form a bird. These will make medium size birds. You will need less dough for smaller bird, and more for bigger ones. All your birds do not need to be the same size. If you are making two or three tier Korovai, I would suggest to use bigger birds for the larger tier, and smaller ones for the top (smallest) tier. 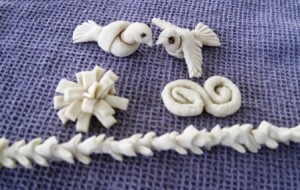 You can also make other decorations, like swirls and pine cones, as I have demonstrated for my Paska decorations. Step 2 – laying out the body and wing parts. body where the wings will cross so they stick better, and do the same to the wings at their crossing point. 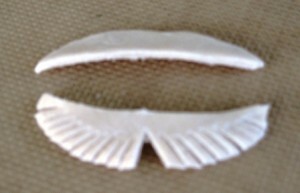 Pinch the front of the head piece, to form a beak. Use tips of whole cloves, or chips from cinnamon stick, or small black seeds, for the eyes. Use a paring knife to feather (make slits) in the flattened ends of the wings and tail of a male bird. You may trim the tail to make it proportioned to the rest of the body. To make a female bird, you tuck the wings under her body. There should be equal number of male and female birds on a Korovai. These birds represent the Wedding Couple. You can also use a different version of a male bird, with different style wings. In this case, you would form the bird as illustrated. 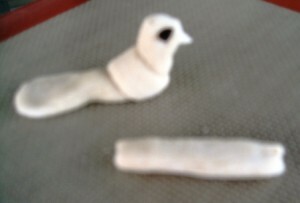 Starting with one dough log, and forming the bird’s body and head, flattening the tail, and wrapping a flattened smaller log over the body, to give it some bulkiness. To form these type of wings, you need to have a short log, flattened to form an oval shape, split it in half lengthwise, and feather the outside edges, starting in the middle buy cutting out a small triangle as above, and feathering toward the tips of the wings. 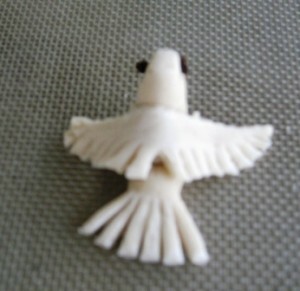 Dab a little water on the back of the bird, and position the wings on his back, as shown. Once all the birds are assembled, brush them with egg white wash, which is an egg white beaten slightly, with addition of a few drops of water. Do not beat the egg white too much, as not to get it frothy, since this will give the birds spotty and flaky finish after baking. 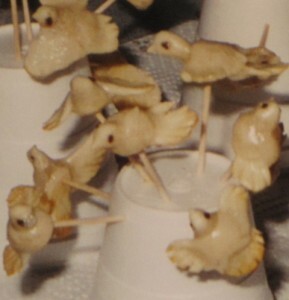 Place the glazed birds, in sitting position, NOT on their side, on lined baking sheet. Bake in preheated oven at 375 degrees F, for about 20 minutes, or until the tips of wings and tails are turning slightly golden. The bodies of the birds will stay very light, do not brown them. Remove from the oven, and while still warm, insert tooth picks into the bottom of their bellies, glaze again with the egg white wash, and set to dry, in a cool airy place, for at least 24 hours, or even few days. Best way to dry these birds, and to store them, is to space them wide apart, and insert the tooth picks into Styrofoam coffee cups. Set the coffee cup studded with birds, on a cookie sheet lined with paper towels, since the egg white wash will be dripping off. These may be made way ahead of time, but do not store them in a plastic bag, or they will mold. Keep them speared on the coffee cups, covered loosely with paper towels, and kept in a dry, cool place, until ready to decorate the Korovai. Besides the birds, branches of the Tree of Life (some Brides prefer their Korovai with that theme), Rosettes, or Cones, and Swirls are used. The Korovai is also decorated with fresh Periwinkle or Vinca (Barvinok), or Myrtle (Myr), and Corn Flowers (Nezabutki), and Poppies (Maki), as well as stalks of Wheat, and ribbons. Here are the steps to make the Tree of Life branches. You need two of these, as they are spread apart at the entry into the Korovai and joined together at the top (Tee Pee like format). 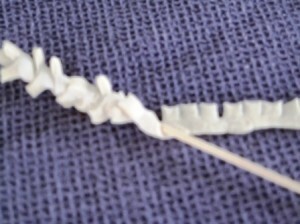 If you prefer to have a more of a regular tree like decoration, with a main tree trunk and several side branches, then it would be much easier to use a floral wire, rather than wood sticks, to assemble the tree format first, then cover each part with the dough prepared in a the same manner as demonstrated below. 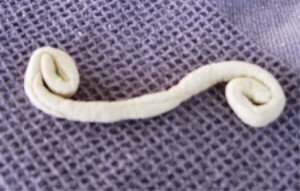 You need to make a long, thin dough rope. Then you need to flatten it. The length of the rope depends on the length of the branch you would like to cover. Branches are usually at least 10-12 inches long, so the dough rope needs to be few inches longer. Using a sharp knife, or scissors, cuts slits along one side if the flattened dough, leaving at least 1/3 of an uncut edge on the opposite side. Get two wooden skewers, and soak them in water. Moisten the uncut site of the dough rope with water, and starting at the top of the skewer, start wrapping it around the skewer, overlapping slightly, so the wood is not exposed, until the whole stick is covered. Leave at least 1/2 inch of exposed stick at the bottom, to be able to stick it into the Korovai during decorating. To make a Rosette, or Pine Cone, you would use the same process as for the above branch, but the dough rope will be thicker and shorter, depending on how large you want this Rosette to be. I used scissors to cut the edge, for a cleaner cut, since these slits are deeper. 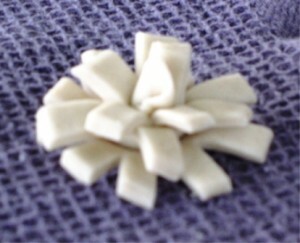 To assemble it, moisten the uncut edge with water, and wind it around at the bottom to form a flower like Rosette. For a taller Pine Cone, you will need a longer dough rope, or even a short stick to help it hold its shape. 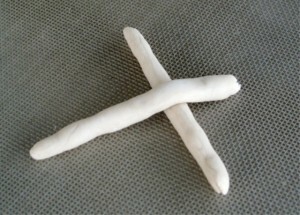 Like with the Love Birds, stick a tooth pick from the bottom, before baking. Baking and drying instructions are the same for all decorations. 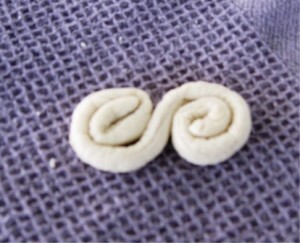 To make the Swirls, you need a dough rope (use your own discretion as to the length and thickness, depending on the size you want these decorations to be). Please remember that these will stay the same size, or may get a little bit smaller during baking/drying time. As you see above, you start curling each end in the opposite direction, until they meet in the middle. These may also have a toothpick inserted in the middle of each swirl, or you can just make pin holes before baking, and use pushpins to fasten them with for decorating. Once baked and dried, it is almost impossible to make holes, without cracking and damaging the decorations. Assembling and decorating a Korovai takes some time (it took me over 2 hours to get mine completed- in the picture above), so do not leave it as a last minute project. It does not seem like it should take this long, but you would be surprised how perfect you want the Korovai to turn out, and how you want everything to be positioned just right, fastened well enough, so it stays sturdy at least throughout the wedding reception, as well as for many years ahead. If you do not plan to use the Korovai for consumption, you can preserve it with the egg wash glaze as well, but make sure it is totally dry, before assembling, to prevent molding. If stored properly, the bread will dry out completely, and will keep for years as a centerpiece on your dinning room table, or in a showcase, as a conversation piece. I heard of horror stories from other people whose Korovai turned into a heap of mold. This means that it either was not baked well, or improperly stored afterward. I kept my daughter’s Korovai on a wire cookie cooling rack, for several months, so that the air was able to flow under it, to prevent any build up of moisture, which helped the drying out process. Once it is totally dried out, it may be set up on a nice pedestal, and serve as a conversation piece. Enjoy your Korovai making experience, and please share pictures, and comments. Hi Suburban Grandma! I just wanted to let you know that I came across this post and I thought it might be useful if I linked back to it from my blog! Thanks for the great information! Thank you so much for visiting. Please stop by again. It would be my pleasure to link our sites. Of course you can link my post to yours, and I will update my previous post about Korovai and insert a link to your blog. Please, stop by any time. Do you make and ship? I need a rush order by Saturday May 16th? I am so glad you found my website informative and helpful, about Korovai making. If you ever made Paska (Ukrainian Easter Bread), you will have no problem making your own Korovai. You still have lots of time to practice and to perfect it to your satisfaction. I am located in Delaware, US. Good luck with your lovely project…you will do a beautiful job…I know it. Thank you very much for stopping by my blog and finding some helpful information about korovai decorating. You did a stunning job with your korovai. I just pinned it to my Wedding Idea board on Pinterest. Also visited your blog…nice job! Hi….for the ingredients for the decorations…is that Crisco oil or the block of Crisco shortening…..
How much does one recipe make for decorations? It is CRISCO shortening….solid shortening, NOT oil. It’s always better to double the recipe, since not all your decorations will “pass your test” as suitable for your Korovai…you will select your best ones….so the larger selection the better…:-) Good luck with your Korovai decorating fun. Thank you for the recipe for the Korovai decorations. I have been searching my mothers cook books and could not find one. 35 years ago mom made one for my wedding and I remember sitting at the kitchen table in her little kitchen making the decorations. But they were quite a bit tinnier than yours. There were Deer, Wine barrels, Doves, rosette, and wheat all in miniature. And when baked they were the same color as the Korovai. Why ? My moms friend from KOLOMUYA was our teacher. She told us to freeze the decorations until I was ready to bake them. Do you do that? Sadly mom passed a few years back and now I need to make the Korovai myself for my daughters wedding. Any Comments ? First of all thank you so much for finding my blog and sharing so many memories with all of us. I have not seen a korovai yet with wine barrels or deer….maybe it was something tied to Kolomeya region of Ukraine. If the decorations were the same color as the korovai, she must have used the same dough, while I have been taught to use a totally different dough, as in my post, and no freezing involved. Actually these decorations need to be quite resilient (hence not eatable) that is why the toothpicks are inserted as soon as possible after baking, before they become really hard. I spoke with a young lady who makes korovai and told me that she loves my recipe and technique for the decorations most of all the other she tried. Good luck with your project, you will do a great job…I know it, because you sound like you have a lot of knowledge on this subject. Enjoy the wedding as well, and please share a picture of your finished project…I would love to post it…:-) Thank you. I would stick with shortening, since these decorations are NOT edible, but rather for decoration only. You have a wonderful site. I too have a blog and I enjoy posting traditional recipes and sharing my past recollections of growing up in a Ukrainian home. I make Korovai and do ship them with in Canada. I enjoy looking at all the different ideas you have posted. Thank you for keeping up on the Ukrainian traditions. If interested take a look at my blog…if nothing else, you may get a chuckle at some of my stories from my younger years. Pryvit Petrosha…Thank you so much for finding my blog and leaving such a nice comment, as well as a link to your blog. I just checked it out and wanted to let you know that you are doing a beautiful job with it. Keep it up. Please stop by again, and feel free to link to my blog at your convenience and I will do the same. My mother passed away before my daughter was married and even though I inew how to make the bread I had no idea how to make the decorations. Your article was a godsend. I would insert a picture but I can’t figure out how, lol. Thank you so much. You are such a sweetheart, and such a great mom to undertake this special task. I am so pleased to know that my recipe and instructions came in handy for you. Thank you for stopping by my blog and for leaving such lovely comment. I would love to see a picture, if you could send me an email and attach it to vlodia@suburbangrandma.com Thank you.